Easily one of my all-time favorite series to play growing up was Worms. Turn-based artillery combat games weren’t exactly new, but the concept of militaristic worms fighting each other across odd landscapes with bizarre weapons was and still is hilarious. It was fun to play by yourself against the AI, but grab an opponent or three and each match would quickly devolve into chaos. I’m happy to say that while it’s limited to two players, Mayan Death Robots not only captures this level of fun quite well but carves out its own spot in the artillery wall of fame. Instead of just turn-based artillery fire, MDR does quite a few things differently. First of all, the objective is no longer destroy the opposition. Each player now has a core they need to keep safe, and the first to fail to do so loses. It can be destroyed by direct attacks, or dropped off the bottom of the map. 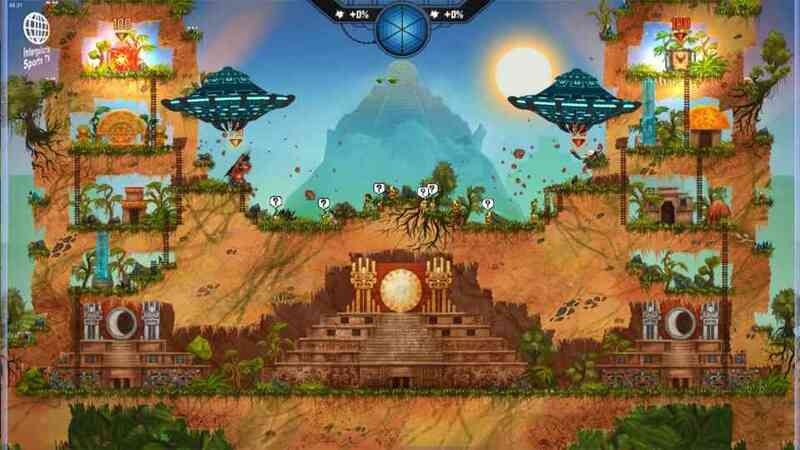 In most scenarios, each player has Mayan worshipers that will protect these cores if the enemy gets too close. Honestly this game can get pretty deep, and that’s just the surface of every fight. Now, since this is kind of a mix between MOBAs, fighters, and artillery games, no two robots are alike. You’re given six to start with and four to unlock, giving you ten fighters total. 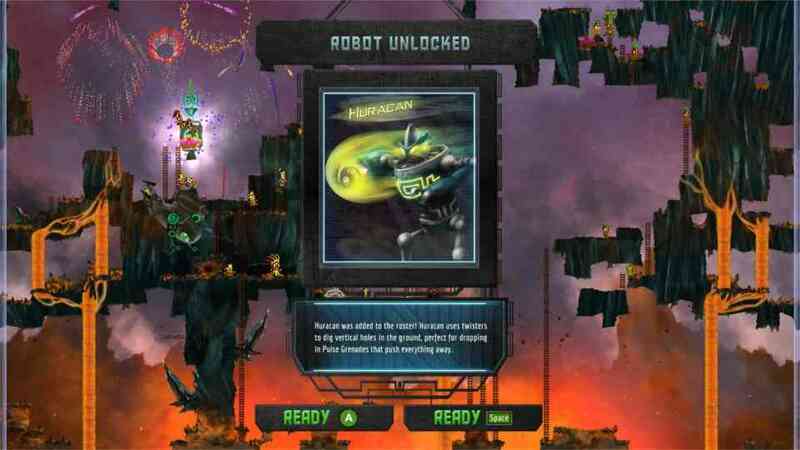 Each robot then has three base actions to choose from each turn: attack 1, attack 2, and jump. You can usually build as well, but I’ll get into that later. On top of this, there are quite a few maps to unlock as well that actually make a pretty big difference when it comes to which strategy you’ll pursue: sink or destroy. Remember those Mayan worshipers? Well, destroying them and some other objects in each map will net you a percentage of increased blast radius, with 2% for the smaller guys and 4, 8, or even 10 for other units and objects. This doesn’t increase your damage, just the blast radius which determines how much land is destroyed by each attack. This is important because players can often spend a turn building multiple blocks of land to keep their core safe, but that no longer matters if you can chew through more than they can produce. So at the start of each fight, you kind of have to decide which route you’re going to take: build up a bunch of blast radius and try to sink their core, or go strictly for damage. 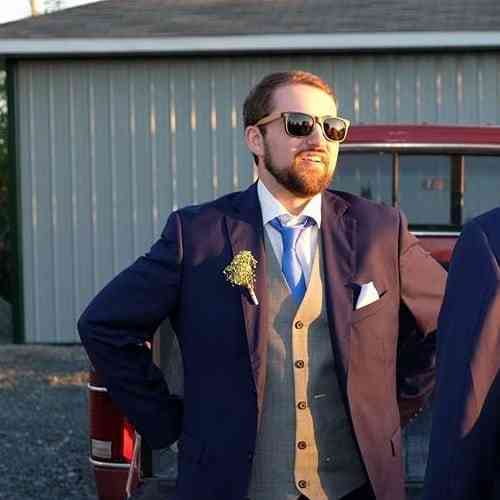 Of course meeting in the middle can work too, but sticking to one is your best bet. Note that increased blast radius is generally always good so if you’re going the damage route but can pick up some easy radius increase, it’s probably worth the turn to dig through any defenses your opponent might build up. 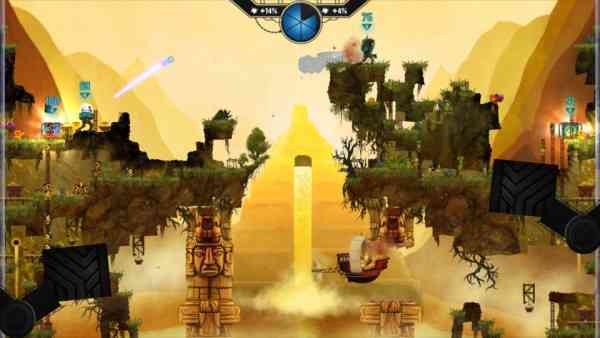 What I’m getting at is that Mayan Death Robots is not just your typical aim and shoot artillery game. There are also special weapons that are doled out every few turns, weather and environmental effects, and Elder Gods that act as mini-boss fights which can completely turn around a match for either side. The only thing that’s limiting is the lack of weapon variety overall, but you get over this pretty quickly once you learn how each robot works and which strategy each of them is best at. MDR is a lot more complex than what you see on the surface. Something else that’s a lot of fun is the art style and concept itself. I wouldn’t be surprised at all if the developers basically just stuck words on a board and threw darts at it, and I honestly wouldn’t even care. However they came up with the idea of putting giant destructive robots in an ancient Mayan civilization is irrelevant. What matters is that not only did they do a great job of combining ancient Mayan aesthetics with robots and Sci-Fi, they’ve done so while keeping everything clear and diverse. The robots all look and behave quite differently, it’s easy to notice all of the potential additional weather/environment effects, and you never feel like you’ve lost sight of the enemy’s core. When all sorts of explosions and special effects are flying across the scene, maintaining that visual integrity in a game like this is key. 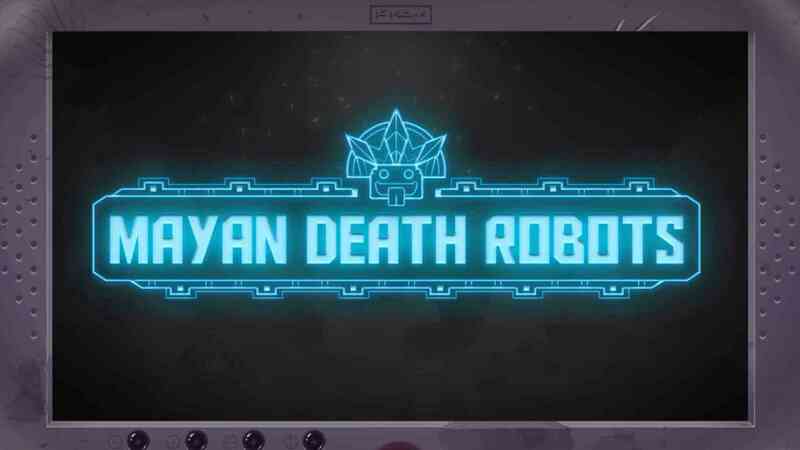 Of course, even a game as fun as Mayan Death Robots is bound to have its problems. I’m annoyed that jumping is the only way to move around, and I really wish there was a walk action. Even just a few steps was sometimes all I needed. Maybe switching out jump for a move action where players could take a set amount of time or distance to walk or jump would have been a better option. There’s also no sort of profile system, so the only way you can track wins/losses is by hand. Some sort of stats menu in general would have really brought a lot to the table, as I’m the kind of person who likes to know just exactly how much damage I’ve done, or how many blocks of land I’ve destroyed over the course of a few fights. 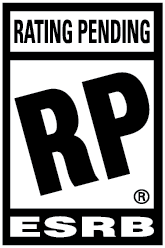 Other than that though, there’s not a lot to dislike unless you just don’t enjoy these types of games. For a little over fifteen dollars you get 10 robots, 12 maps, and a campaign that will take at least two or three hours depending on skill level. Spending a few weekends destroying each others’ core is really just icing on the cake at that point, and frankly it is some of the most fun I’ve had with artillery games since I was a kid. Whatever your reason for buying MDR, be it the wackiness, gameplay, or art, you certainly won’t be disappointed.